Mouse anti Human C3d antibody, clone 053A-514.3.1.4 recognizes human complement component 3d (C3d) neoantigen, a ~33 kDa polypeptide fragment generated over the course of complement activation in which where complement 3 (C3) convertases cleave C3 to C3b, which is further degraded into iC3b and C3dg/C3d. C3d is involved in the regulation of many aspects of the immune response, including antigen processing and presentation. The C3d/antigen complex mediates B cell activation by simultaneously binding antigen-specific surface bound immunoglobulin and CD21, lowering the complement activation threshold. C3 is crucial in the induction of tolerance generated when an antigen is introduced into immunoprivileged sites and this is exploited by pathogens and cancer cells to evade the immune system by inhibiting complement activation. Verghese PS et al. (2016) The clinical implications of the unique glomerular complement deposition pattern in transplant glomerulopathy. Kashiwagi, N. et al.  (2017) Method for measuring anti-drug antibody. Bergmann-Leitner, E.S. et al. (2006) Complement 3d: from molecular adjuvant to target of immune escape mechanisms. Clin Immunol. 121 (2): 177-85. Barilla-LaBarca, M.L. et al. (2002) Role of membrane cofactor protein (CD46) in regulation of C4b and C3b deposited on cells. J Immunol. 168 (12): 6298-304.